Trouble viewing the video? Stream or download it on PBS LearningMedia. Manu Prakash, a bioengineer at Stanford University, has created a fully functional microscope out of waterproof paper that uses teeny-tiny lenses to magnify objects. He calls it a Foldscope. The different parts of the microscope are printed on paper, which the user punches out and folds together. The Foldscope requires no power outlets and works with standard microscope slides. 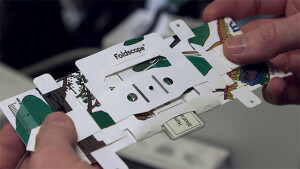 A close up of the Foldscope. Microscopes are important tools that allow people to view objects that are so small that you wouldn’t ordinarily be able to see them, like bacteria or blood cells. From healthcare workers using microscopes to look at blood samples to diagnose diseases, to forensic scientists using them to study evidence from crime scenes, many different kinds of microscopes have been developed for a variety of purposes. The Foldscope operates a lot like a traditional microscope in that it uses lenses to bend light in order to make tiny images appear larger. Light travels in waves and when it passes through media with a different density than air, such as water, the light changes direction, or bends. This is why a pencil looks bent when it is halfway submerged in a glass of water. This bending of light is known as refraction. Curved objects, such as lenses also bend light. How the light bends depends on how curved the lens is and the material it’s made out of. Convex lenses, which are thicker in the middle and curve outward, can be used to magnify objects. 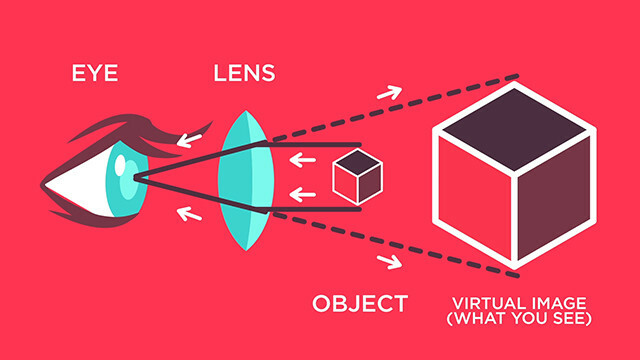 A convex lens can bend light and make an object appear larger by creating a larger virtual image that your eye can see. A magnifying glass is the simplest kind of microscope — a convex lens with a handle attached. How much an object is magnified depends on several factors, including how curved the lens is, the distance between the lens and the object, and the distance between the lens and the user’s eye. The more curved the lens is, the higher the magnification it offers. Magnifying glasses are limited in how much they can magnify an object; usually, they can make objects look around 2-10 times larger than they actually are. More advanced microscopes combine multiple lenses to bend light in different ways in order to magnify objects even more. Foldscopes use salt-grain sized lenses that are highly curved. The extreme curvature of these lenses allow for high magnification. For this reason, Foldscopes don’t require long tubes of stacked lenses to magnify objects, like other microscopes do. This is why the Foldscope looks flat compared to larger, more traditional microscopes. Even though they are made out of waterproof paper and tiny lenses, Foldscopes can make objects appear 2,000 times larger than they actually are. This makes it possible to see really small things, like cells and bacteria. This video is part of our Engineering Is Diagnosing Diseases with Origami Microscopes e-book. The e-book explores the science and engineering principles behind Manu Prakash’s Foldscopes project, and includes videos, interactives and media making opportunities. You can find our other e-books at kqed.org/ebooks. Adrienne Calo has been a producer of PBS films, specials, and series for the last 12 years. In 2006, she joined the KQED arts series, "Spark" as Coordinating Producer, and became Series Producer in its 6th season. Segments she produced for the series earned her four Northern California Emmy nominations. Adrienne then went on to work with social justice media company The Working Group, serving as a producer on their national PBS film “Not In Our Town; Light In the Darkness”, a portrait of a Long Island community in the aftermath of a hate crime. Most recently, Adrienne was the Coordinating Producer of the national PBS series "Sound Tracks: Music Without Borders", which uses music to tell stories about international culture and politics. In the course of her broadcasting career, Adrienne has also contributed to programming for ABC News/Nightline, This Week in Northern California, and Austin City Limits. Prev Diagnosing Diseases With Origami Microscopes Next Would You Eat Insects?